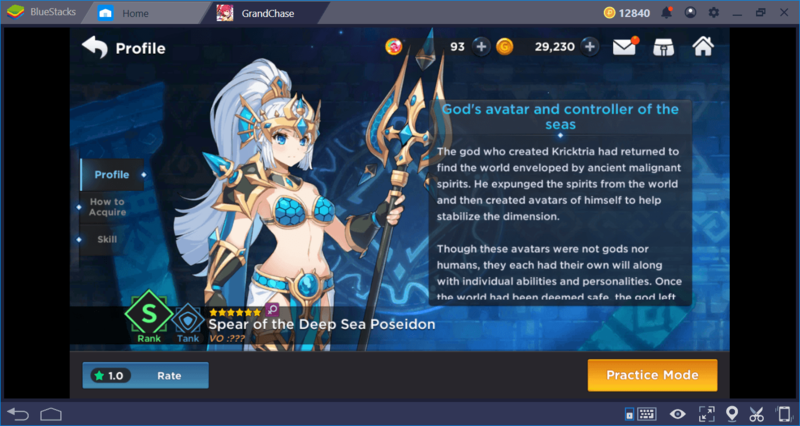 GrandChase is an action RPG game using gacha mechanics. In other words, you need to summon new heroes until you find the best ones. After that, you will focus on making those heroes stronger. These are interconnected systems, but both work independently. So, if you want to create a party of the best heroes in the game, you need to know how both systems work. 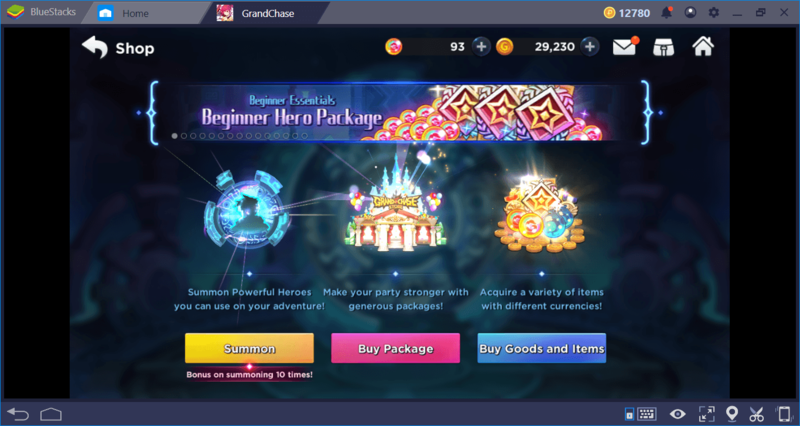 That’s why we prepared this guide: Below, you’ll find answers to every question you’ve been wondering about the GrandChase Summoning system and Hero mechanics. You can reach the summoning menu via the “Shop” screen. 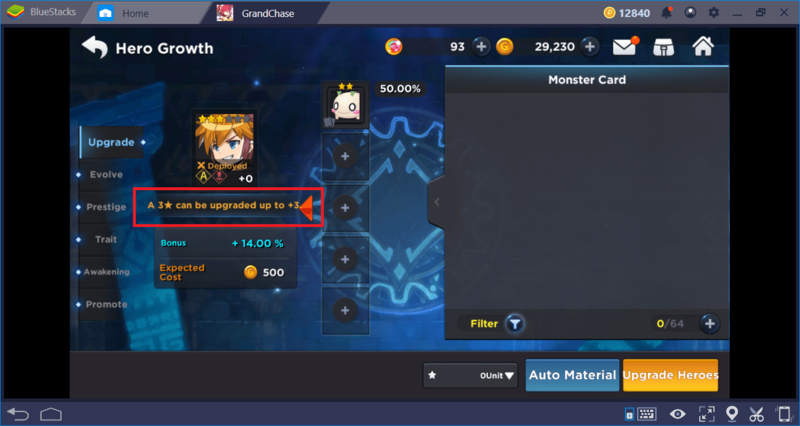 There are three summon methods you can perform: Special, Premium, and Rare (normal). Each of these options allows you to get a hero. However, the rarity of the hero depends on the method you prefer. 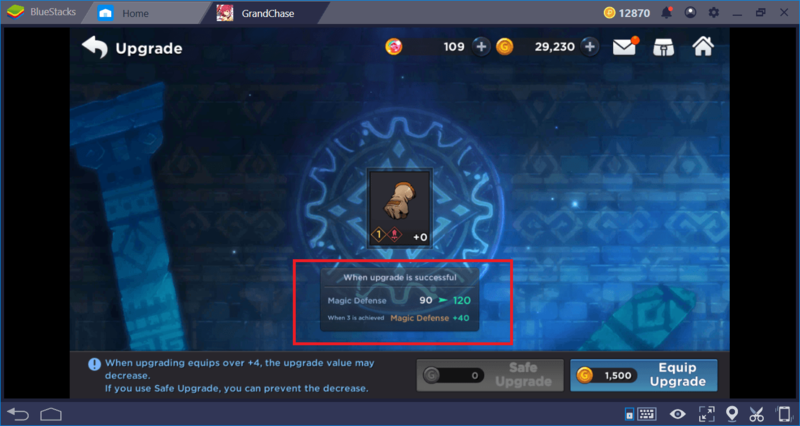 As you can guess, the most valuable and rare heroes can be obtained by the Premium method. Below, you can see a table showing which currency is required to use these methods. So, what kind of heroes can be summoned with these methods? What’s the difference between Special and Premium? At the beginning of the game, you can make a single premium summon for free. 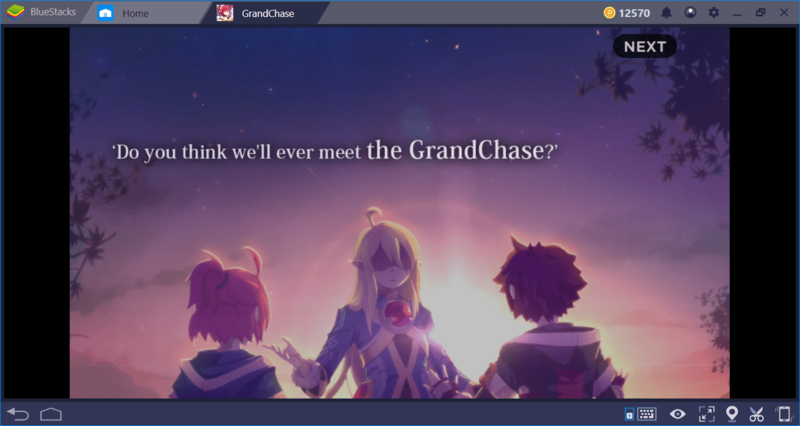 (We talked about how you can use this feature in your favor with the BlueStacks Multi-Instance.) Other than that, you need to use a ticket each time. 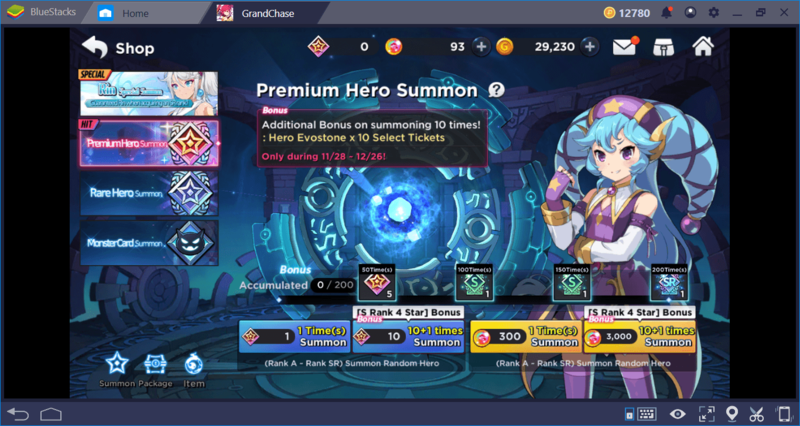 Premium summon allows you to get a random high-level hero. This is the only summoning you can do using “gems”. 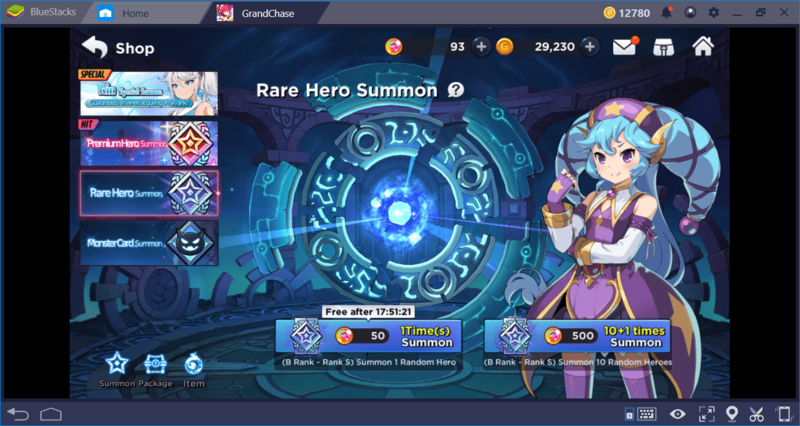 You are allowed to do a free summon every 24 hours. If you want to do more, you should pay 50 gems each time. As you can guess, the heroes that can be obtained for free with this method are of lower quality and rarity. 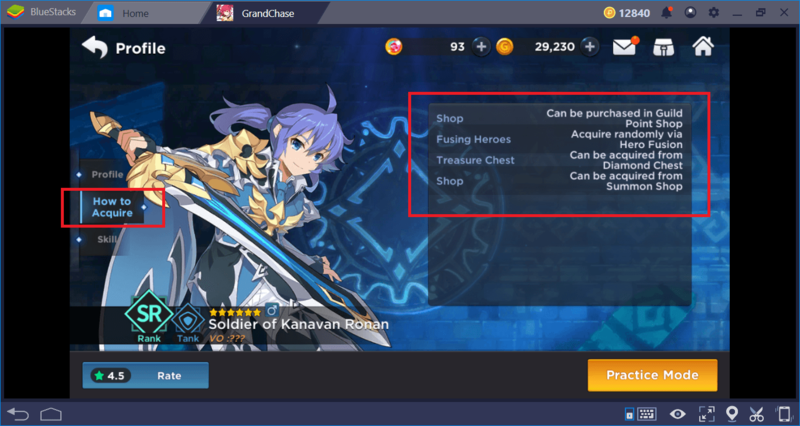 In other words, if you are playing for free, you will mostly get B class heroes that have 3 stars at most. So, what do these classes and star numbers mean? First of all, there are more than 100 heroes in the game. With future updates, we are sure that this number will increase further. The shortest way to get them can be summoning, but that’s not the only way. You can also get heroes by completing story missions and other activities. To find out how to get a hero, click on it and choose “how to acquire”. There are two characteristics that determine the power and rarity of each hero: the number of stars and the ranking. Heroes can have 6 stars in total. The more stars a hero has, the stronger it is. Stars are not fixed values: By upgrading the heroes, you can increase the number of stars up to six. This is called “evolution”. You can sacrifice low-level heroes for upgrading the star number of others. The more heroes you sacrifice, the better the result will be. This also requires you to use increased amounts of gold each time. You can increase the ranking of a hero that is upgraded to 6 stars. 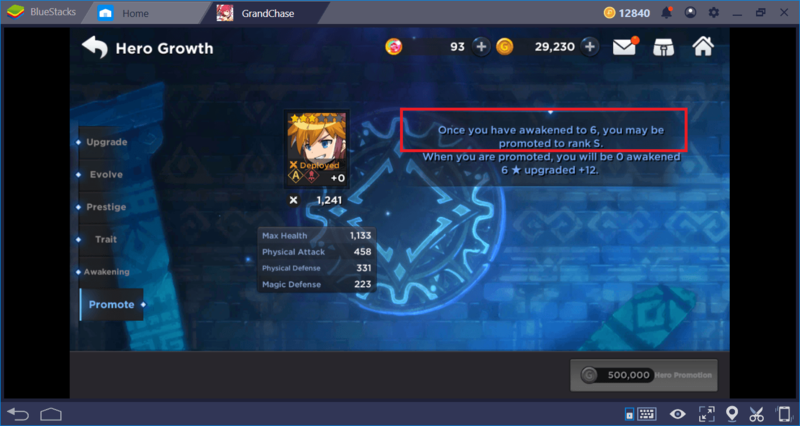 Increasing the ranking is called “promotion”. In short, if you work hard enough, you can turn even the worst hero in the game into the best one. However, if you can get a hero with a high number of stars and ranking, you don’t have to deal with this process and you can save time & resources. Speaking of ranking, there are a total of 4 ranks, which determine how special and powerful will the skills of the heroes be. The rarest heroes have “SR” ranking. After that, the ranks are determined as “S”, “A”, and “B”. 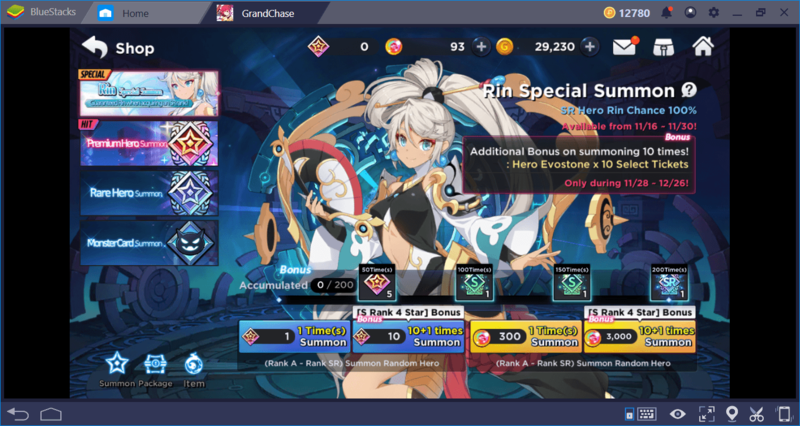 In other words, a 6-star SR hero represents the strongest character you can get in GrandChase. Your goal is to increase all the heroes of your party to this level. 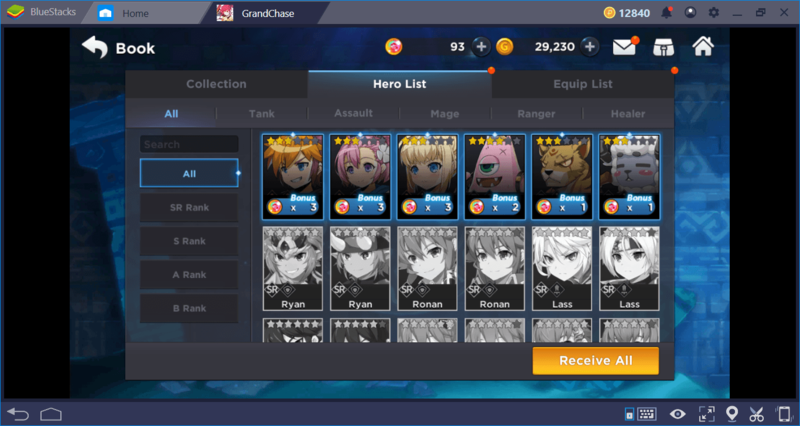 Increasing your heroes’ rankings and star numbers is not the only thing you can do to make them stronger. You can also train them and use various equipment to help them earn bonuses. Let’s start with equipment: Completing story missions and other activities will award these items, in addition to XP points. There are a total of 8 types of equipment and you can place an item in a slot to make your heroes gain various assault and defense bonuses. Open the “Party” screen and select the hero you want. 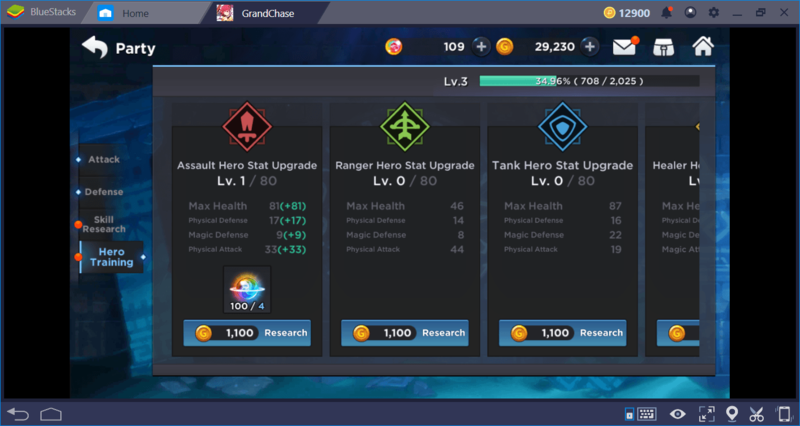 Click on each equipment to see what bonuses they give. 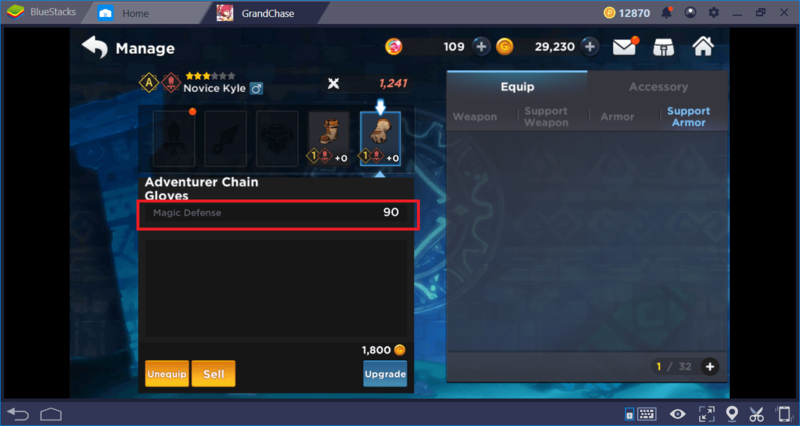 You can sell equipment you don’t use or upgrade the ones you liked. Upgrading is the easiest and practical way of gaining additional bonuses until you find better equipment. Since it costs only a small amount of gold, we recommend that you upgrade all your equipment. Training enables the heroes to increase their basic stats. First training can be done with gold, but after that, you have to use a special gem called “Blessings of Valor” each time. These gems can be purchased from the store or gained free of charge from story missions. Theoretically, if you give enough training, you can change the role of each hero. For example, if you give “tank training” to a healer character, his role will eventually change. But do not do this: It will take very long and be pointless. Instead, train each hero according to his/her role. This way, training will be more efficient. For example, when a tank-class character receives tank hero training, his health points will increase much faster. 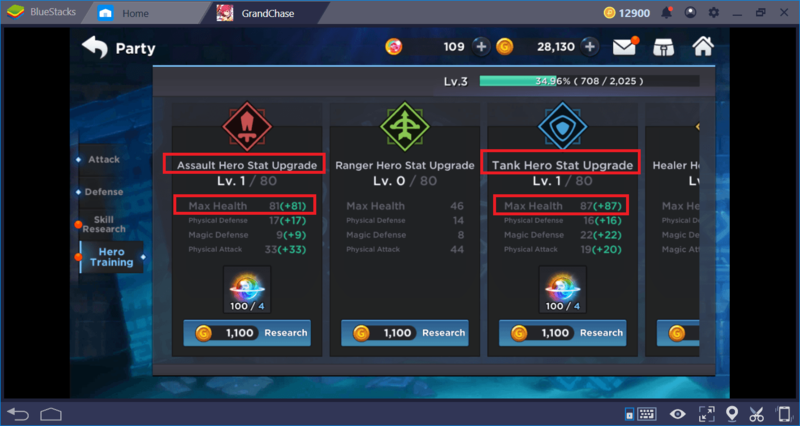 However, if you give “assault dps” training to the same character, the health increase will be much less. To summarize, there are many ways to add new heroes to your party and make them stronger, but now, you learned which ones are the most efficient. Using what you learnt, you can create a party of the most powerful heroes much faster. 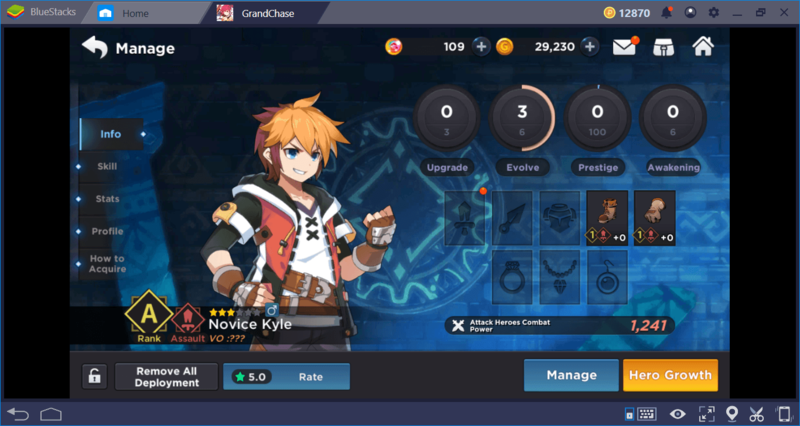 Don’t forget to read our other GrandChase guides to be more effective on the battlefield. We wish you all the best on your adventures!